MINNEAPOLIS, MINN. – The Bank Insurance and Securities Association (BISA) recently recognized Trinlogix, LLC with a 2017 Technology Innovation Award. Trinlogix was recognized for the addition of automatic Interaction Reports™ to its patented interactive visualization tool. 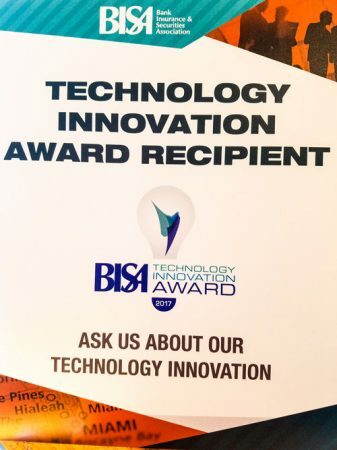 BISA’s Technology Innovation Award highlights leadership in the advancement of the financial services industry’s products, services and platforms through technology innovation. It is designed to recognize companies for their commitment to technology based solutions and advancements. The Trinlogix Interaction Reports™ are created automatically any time the Trinlogix cube is used to view portfolios / funds in its interactive 3D view. The Interaction Reports™ are fully searchable. “With the implementation of new DOL regulations pending, we wanted to create a better way to track interaction – whether with the client or for internal compliance oversight. No matter what happens with the new regulations, we can all agree that more documentation is better.” said Ted Toso, CEO of Trinlogix. The Interactive 3D Portfolio View Tool is made up of a heat sensing map that allows advisers to quickly view funds and equities as up (green) or down (red) with the ability to drill down quickly to individual equities (spheres) or zoom out to see groups of equities (columns). It allows for easy side by side comparison of portfolios. Advisers are using it as an analytic tool and at a high level for more effective client presentations. The tool is a secure cloud based solution that can be utilized in the office or as a mobile app. The product can be purchased as a subscription for $99 per month as a single user or negotiated group rates. It can also be licensed, with the ability to port the product via its API first design into a website or dashboard, allowing white label and branding opportunities. With the growing trend toward robo-advisors, Trinlogix has created a necessary tool for online users, but it’s also a valuable tool for traditional brokers and advisors as they look for better ways to communicate with clients and differentiate themselves in a very visual way. The Interaction Reports™ are the latest feature of this cutting edge tool. Trinlogix, based in Minneapolis, MN, is a software company serving the financial industry with its patented flagship software tool that creates clarity via an Interactive 3D Portfolio View. For more information about Trinlogix or its products contact Jason Spafford at Spafford@Trinlogix.com.